NICK VUJI IS FOUNDER OF ‘LIFE WITHOUT LIIMBS,’ A GLOBAL MINISTRY. I’d heard of Nick Vujicic. I’d caught a glimpse of him on Christian television. But nothing prepared me for his recent appearance at my church. 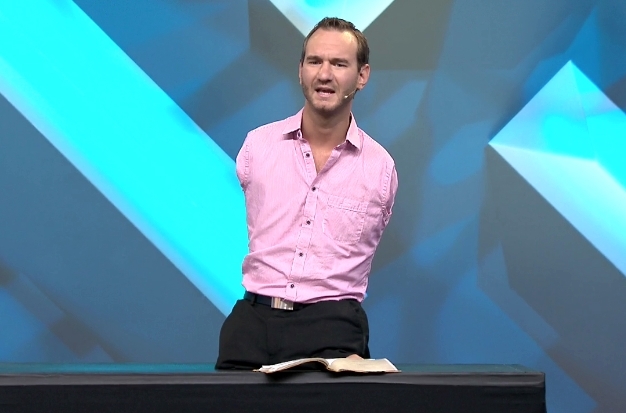 A mighty man of faith, Vujicic delivered one of most powerful, spirit-filled messages I’ve ever heard. I think the Australian-born evangelist the most inspirational Christ follower since Helen Keller. Keller’s life story was immortalized in the 1962 motion picture “The Miracle Worker.” Born in 1880, Helen was 19 months old when she contracted “brain fever,” as the Keller family doctor called it. She was struck blind, deaf and mute. Nearly feral as a child, Helen’s desperate family found her a teacher – Anne Sullivan, the miracle worker – who leaned in and, over time, got through to the blind, deaf and mute girl, teaching her to communicate. In one of her letters to Rev. Brooks, Helen told the clergyman that, even before she could communicate, she knew about God. She felt His presence in her darkness; heard His still, small voice in her silence. Helen didn’t know what to call the presence that was always with her. The tender-aged blind, deaf and mute girl had no concept of names. But she knew God. I can’t help wondering if Helen Keller might have been present, in spirit, on that recent Sunday when Nick Vujicic visited my church; if she might have been among that “great cloud of witnesses” of which the Apostle Paul wrote about in his Letter to the Hebrews. Nick was born 31 years ago with tetra-amelia syndrome, an exceedingly rare disorder that consigned him to a life with no arms and no legs. By age eight, Nick despaired that he was not like other kids; that there was no happy future awaiting him. And, two years later, he tried to end his misery by drowning himself in the bathtub. But God had put a hedge around the boy. Nick’s repeated attempts to take his own life failed. Over the next few years, young Nick was awakened to the Holy Spirit working within him. And, at age 15, he gave his life to the Lord. By immersing himself in God’s Word, Nick learned that he was not cursed at birth, but “fearfully and wonderfully made.” He learned that his being born without limbs was not purposeless, but “so that the works of God could be revealed” through him. And the Lord has, indeed, done miraculous works through Nick and his global ministry, “Life Without Limbs,” as the evangelist has traveled throughout the world sharing the Gospel. Like the time Nick traveled to Mumbai, India. The Holy Spirit moved him to visit the city’s red-light district; to go from brothel to brothel preaching Christ. At one brothel, a woman asked Nick to pray for her sister, an invalid who had not walked in four years. The woman had previously prayed to her assorted Indian gods. She had bowed before their graven images. She had left offerings. All, to no avail. So Nick prayed aloud, in Jesus’ name. And, lo! and behold!, the woman’s invalid sister stood and walked for the first time in four years. The women of the brothel were dumbstruck, much like those who witnessed Jesus heal the blind, the lame and the leprous. They repented their lives of sin and declared Jesus their Lord. Their chains were broken. They were set free. And it was because the work of God was revealed through Nick Vujicic, a man with no limbs, a mighty man of faith. 08 Jun	This entry was published on June 8, 2014 at 7:13 AM. It’s filed under EVANGELISM and tagged 'THE MIRACLE WORKER', HELEN KELLER, NICK VUJICIC, REV. PHILLIPPS BROOKS, TETRA-AMELIA SYNDROME. Bookmark the permalink. Follow any comments here with the RSS feed for this post. Just to let you know that Helen Keller was no Christian. She was heavily into the occult, and used many of the occult symbols in her hand signs. The sign for ‘I live you’ is the ‘El Diablo’ hand sign. You can research her on the web. Please dont use her again in your comparisons with other believers until you’ve researched her. Please don’t be deceived about this woman. Blessings.